Unfortunately (for them), as we wrote earlier this week Canada is to the US what Australia is to China. Australia is perhaps best known for its beer drinkers, barbecues, crocodiles and sheilas, but don't let that fool you into underestimating the business savvy of those Aussies. The island from downunder is leading the developed world in economic recovery and investors are starting to take note. "Sheila" is an Australian colloquialism for a woman. Australia's trade with China has been key to keeping the economy growing, but Mr. Redican says quick economic management has also been vital in preventing recession. Australia was the only developed country to avoid the latest recession, allowing it to continue on its record run of 17 years of consecutive economic growth. "Monetary and fiscal policy stimulus has probably been more effective in Australia than it has anywhere else in the world," Mr. Redican says. He says this is not just because of the federal government's quick cash payments to taxpayers to spur consumer spending, but also because of the dominance of variable rate mortgages in the country. (rut roh raggy) This meant that when the central bank lopped 4.25 percentage points off the benchmark interest rate over the course of six consecutive decisions - taking the overnight cash rate to a 49-year low - the effect on home buyers was overwhelmingly instant. "The fact that the jobless rate has actually fallen will be a tremendous boost for confidence," says Craig James, chief economist at CommSec in Sydney. "Employers will have confidence to start hiring again and consumers will be less fearful about losing their jobs and thus be more inclined to spend." Mr. James says interest rates would likely be back at "normal" levels of about 5% by the end of 2010. In a related note Ben Bernanke said last Friday that American interest rates will go up from zilch "someday"; I assume someday will come after the end of 2010 - but not to worry as we see all around us, our economy is fine and healthy. Just because other countries will be back to normal interest rates before we even consider raising rates once should not be a black eye or cause you 1 iota of consternation. It should not denote that the American people and corporations are addicts to cheap money and cannot function without it. Just move along and wait for the next stimulus that will soon come our way since as we all know healthy economies deserve a new stimulus every 90 days. Click your shoes three times and repeat "we're healthy" and "we're not Japan" (feel free to mix the two). Also it would help if you shrill "Australia stinks, we're #1. USA! USA! USA!" Don't you feel better now? I know I do - dogma always satisfies the soul. 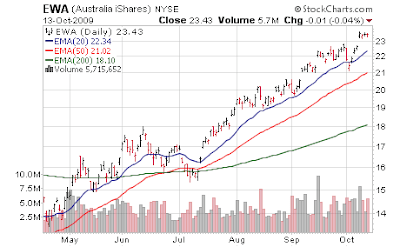 The S&P/ASX 200 index, Australia's benchmark stock index, is up 27.7% in the year to date, only slightly ahead of Canada's S&P/TSX composite index which is up 27.3%. However, the Australian dollar has outperformed the loonie, appreciating 28% against the loonie since bottoming in October last year. Folks - don't even try to price the return of the S&P 500 in either loonies or Australian dollars. We don't want to end the mirage of prosperity. Remember the chants I gave you in the preceding section. Against the greenback, the Australian dollar was buying US$90.37¢, up 51% from a year ago. Errr.... well let us pray no Australian bought an American stock a year ago. As the difference between Australian interest rates and the rest of the world increases, the Australian dollar is predicted to strengthen further. "It's not out of the question that it will reach parity with the U.S. dollar within the next year," Mr. Redican says. There was also a good chance the Australian dollar could hit parity with the loonie, he adds. ... the Australian stock market also offers exposure to commodities, particularly base metals and precious metals, but with less of an emphasis on oil and energy. "If you're a little concerned about oil prices, then Australia could be a better place to be than Canada in that respect," he says. "Our banking sector is an area we're very positive about. The banks are in a pretty strong position to perhaps pay higher dividends next year," he says. He says Australian banks, like those in Canada, were less hard hit by the global financial crisis than others around the world and are now well placed to grow amid an increase in domestic demand. Unfortunately neither American nor London bankers threatened to move to either Sydney or Toronto to avoid the "persecution" of regulators or to"get the salaries that benefit our extreme level of skill". Now, without all the magical financial innovation of said select niche of bankers, the Australian and Canadian economies are in a terrible place where the central banks have to step in with wild money printing to provide backstop to the entire economy for as long as the eye can see. I'm describing America, and not Canada or Australia? Hmmm.... I am so confused. How do these countries have viable banking systems without the most talented people on the planet (and there are only a few thousand of them worldwide - just ask them!) slicing, dicing, and bring a country prosperity by shuffling paper in rapid succession while concurrently sucking money directly out of the peasants wallets? How does a modern economy work without the witchcraft... err financial innovation... that these few souls on the planet can bring to a nation? The talent is so rare and these other countries lack the talent (or else they'd be compensated appropriately) - yet somehow their recoveries seem so far ahead of ours. All their banks do is ... lend money at a credible interest rate? What an outrageous concept - have they not advanced over time? Something is not adding up... none of this is explained in my dogma pamphlet. Will someone from Goldman please call me at 1-900-Been-Duped? Anyhow, I was really excited about presenting readers the story of Australia but now that we see they do not have the financial brainpower and innovation that the US and the UK have, I am having second thoughts. Certainly without the 1 in a million talent level of the financial oligarchs, the long term is bearish for these countries. In fact I am surprised Australia could put together 1 year of GDP growth, let alone 17 straight. Must be just 17 years of pure luck - without oligarchs, you have nothing Australia...nothing! It's really too bad - ah well, they still have their Sheilas.